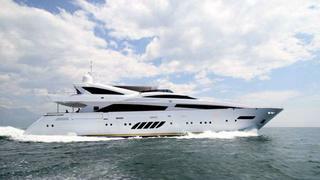 On February 11th 2013 we published news of the launch of the 48m motor yacht Vellmari at Rossinavi and now Camper & Nicholsons tells me that Rytis Babravicius has sold her predecessor, a 39m from the same yard. Built by Rossinavi in 2010 as a semi-displacement yacht, the 39m Vellmari has a striking interior by Team 4 Design with accommodation for 10 guests in five staterooms. Twin 2,400 MTU engines give her a cruising speed of 21 knots and top speed of 25 knots.